Totally feel you on the mistrust of religion, I'm not spiritual tho ive jumped on the mindfulness bandwagon. I'm reading this right now, the introduction is super interesting, you should totally get this. The Quran is all about reaffirming what happened before with all the prophets n shizz. Jews and Christians are called 'people of the book' as they came before and the quaran is all about them. [Book] Quran - Abdel Haleem, if you're looking for the Quran in book form, this one is written in extremely clear modern English that makes it easy and pleasurable to read. [Web] English Tafsir -Sayyid Abul Ala Maududi, Online English commentary of each chapter of the Quran in clear English. [Web] Quran - The Noble Quran in various translations conveniently Online. If you are someone who is searching for the Truth, then you should sincerely ask God to guide you to the straight path. (First chapter of the Quran has this kind of prayer). You really ought to read the whole thing -- I'm biased there, not because of my religious views (I'm an atheist) but because it's one of the world's great religious texts and not enough Westerners expose themselves to other cultures. 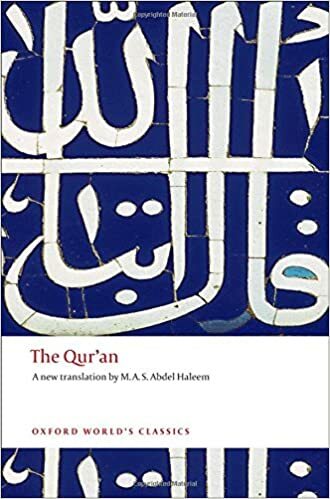 The whole thing is freely available in English on this website (superior poetic format) or Abdel-Haleem's translation (arguably the best prose form out there). The best suras to read if you just want to borrow some apocalyptic imagery are probably suras 69, 70, 81, 82, 84, 85, 88, and 101 (don't worry, all of those are really short, some are less than a page). While reading, bear in mind that the Qur'an was inspired by and responded to Christian and Jewish ideas about the end of the world, too. It's fun to spot the changes.